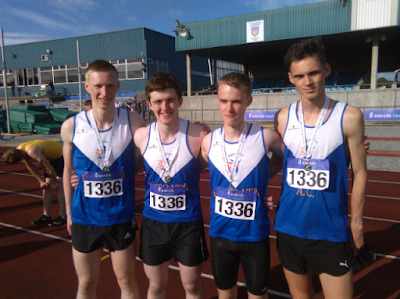 Our u 23 4 x 400m relay squad of Brian Kiernan, Naoise McKenna, Peter Kilgannon and Conor Duncan broke the club senior record by almost 7 seconds when finishing second in the national under 23 championships in Tullamore today with a time of 3 mins 27.71 sec. Ratoath and Menapians a/c exchanged places right through the race but at the tape it was the Wexford club that held on by a whisker to take the title. While naturally disappointed, it still represents magnificent running by all four of our lads.